Chef’s Salad is a type of salad which consists of hard boiled eggs, cold cuts, tomatoes, cucumbers, cheese and lettuce dressed with thousand island dressing. A salad that originated from a salad called Salmagundi which was a popular salad during the 17th century England and colonial America. A really easy salad to prepare which good for the coming summer season here in New Zealand, its light, its flavourful, it is satisfying, in fact I can eat it alone without my mains. Another simple and love recipe Raymund though probably I will reduce the number of eggs inside. I love this salad as long as it’s not drowned in dressing. 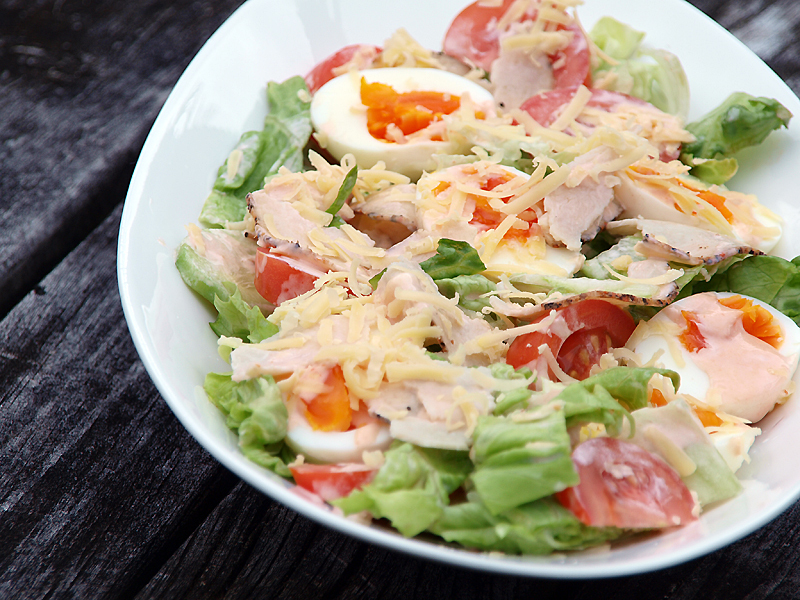 By adding the cold meat and eggs It’s a great way to have a more “substantial” salad and using various cold cuts also gives variety if you are trying to be healthy and have salad really often too since the plain lettuce and tomato combo gets a bit boring after a while. *Another* recipe to save! Yum!!! Lovely photo, evidently it is getting warmer where you are, what a lovely salad. Wow, those eggs look crazy good! This (to me) is a perfect meal. Especially out there in our lovely NZ sunshine! Heh, heh, heh–a variation on what we had for dinner yesterday! Chef’s salad is such a great way to liven up miscellaneous ingredients by combining them in one tasty dish! Chef salad is one of my favorite salads. Very simple but pack with flavors. This looks very delicious, Raymund! I think I’m the only vegetarian who doesn’t really like salad. Unless its spinach, because I love spinach! Iceberg seems to be making a real comeback around here! The egg on top. It does a trick on me, and it works! I want this salad… Looks really delicious!!! Such a simple and delicious salad – makes me want one now. That is one of the best looking chef looking salads I’ve seen. I love them, they’re so tasty. Just found you, Raymond…hopped over from the German Foodie! You have a wonderful site, I will visit often. Now I need to make me a Chef’s Salad, sadly, eggs here (central Alberta, Canada) don’t look quite so grand!